Hello, Now I'm trying to amplify an AUX-Signal with a 12V DC supply voltage. I tried die setup from Here's here as u can see in the sketch below. But all I get is just an annoying noise sounding horrible. For the amplifier I used both the CA3240EZ from http://www.kynix.com/Detail/712544/CA3240EZ.html and the OPA134PA from http://www.mouser.hk/. Maybe my grounds are not connected correctly. It would be awesome, if anyone could help me out. The voltage is pretty stable at 12,18V as far as I can measure it with my voltmeter. I changed now the 22kΩ into a 2,2kΩ resistance, so the gain should be 1. As i decrease my volume the noise also decreases. And if I have volume = 0, one cannot here anything out of the subwoofer. I still get this annoying sound. I put AUX IN normally to my receiver and set the volume to 0. then inverted, non inverted and output are ALL at 6,1V to ground. You may try adding a resistor between the non inverting input and C3 to isolate it from the divider. Having it tied directly like that may be causing oscillation. I may see the problem - questionable quality caps! Try Panasonic FM or FC, Nichicon UHE, UPS or United KZN. 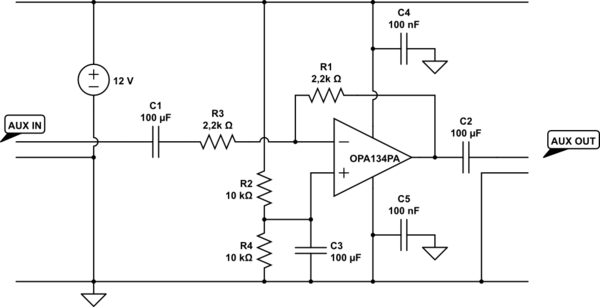 Opamps are really finicky devices with impedance on the rails and need bypassing ESR in the milliohm range. Thank you so much! I have solved my problem. It's my fault to attribute my thanks to you today.